2-Pack / 15 Servings Per Container – The ultimate Quality, at the Best Value. 100% Pure Whey Protein Isolate: Just pure protein. 25 grams per serving. No protein blends, no added fillers, gelatin or binders, and no bulking ingredients. Its high purity means it goes to work right away. Plus, we've left out nearly all the lactose, carbs, fat and cholesterol. Sugars? Got that covered too - its low glycemic, so it won't spike your blood sugar. It's simply the finest protein you can find. Like Nature Intended: Clean and natural. No artificial flavors or colors. No artificial sweeteners. Certified hormone free and antibiotic free. Only four ingredients. 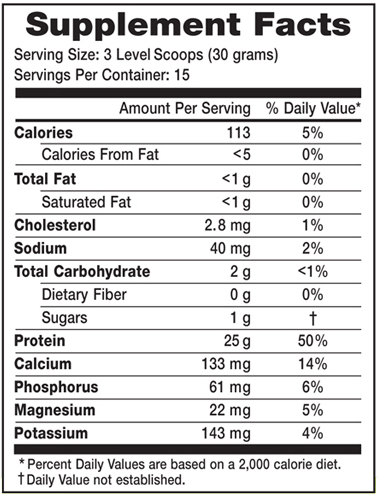 Plus, it's not "altered" with a single amino acid to artificially increase the protein content. Cold processed and undenatured. It's the most complete protein you can buy, with all 9 amino acids. Great Tasting: Not chalky, grainy or clumpy, and no strange aftertaste. We guarantee it's the smoothest best tasting protein you'll ever buy. Just mix away. Amazing Price: Our best price ever. Don't worry, the math is right -- we're giving you our absolute best . And with 25 grams of 100% isolate protein per serving, it's one of the hottest values on the market today. 25 grams provides the average person with 50% of the Daily Value (DV) their body needs. But the main reason you should consider whey protein is its digestion rate. Whey protein requires very little digestion, giving you "fast" nutrition for fueling your muscles during a workout, and assisting with recovery afterwards. * Whey protein is often referred to as an “anabolic protein,” since levels of blood amino acids usually peak within 30 to 60 minutes of the protein being absorbed. A whey shake is your better choice for fast-acting protein as compared to whole food protein such as meat, or casein protein found most commonly in dairy products. Our Isolate is manufactured with state of the art filtration techniques that remove most of the lactose and fat. This nearly pure form of makes it a better choice when you’re seeking to rapidly deliver protein to your body. It’s also the better choice if you have a lactose sensitivity. People with lactose issues will generally have a harder time digesting whey protein concentrate products. Protein is an essential component of any balanced diet. But you may not realize all the additional benefits protein provides. First and foremost, it fuels you with essential building blocks for a strong, lean and optimal body. It also builds and repairs muscle, an important factor as people age, since muscle mass declines as we grow older. Protein helps aid normal immune and cardiac function. * Protein can also provide a metabolic boost if you’re trying to achieve a healthy weight. Protein can be the nutritional component you’ve been looking for to take your exercise and wellbeing to a whole new level. Data on file, Eniva Corporation, 2017. Ingredients: Whey protein isolates, natural flavor (vanilla), stevia, sunflower lecithin. Directions: Adults: 1-6 scoops daily. One may increase dosage as needed per nutritional and physical demands. Recommendations: Mix with 8 –16 ounces of water or favorite beverage/smoothie. Storage Directions: Store in a cool and dry place. Caution: Do not consume if tamper resistant seal is broken/missing. Do not consume if you are allergic to ingredients. As with all dietary supplements, contact your doctor before use. If taking prescription medications, have an ongoing medical condition, are pregnant, nursing or under age 14, consult doctor before use. Isolated vitamins or nutrients are best taken as part of a well balanced diet and broad supplement program. KEEP CAP TIGHTLY CLOSED. KEEP OUT OF REACH OF CHILDREN. Best protein powder ever. I already recommended this to my friends and they like it too.